With spring around the corner it is a great opportunity to get our fifth grade students thinking about the bicycle as a way of getting places (for fun or for transportation). 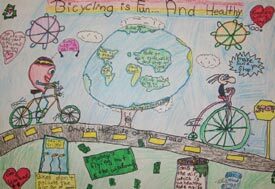 Ask each student to create a poster that reveals his or her understanding of the many different values of bicycling (it is fun, healthy and green). Students should make sure their poster follows the contest rules by using the checklist below. 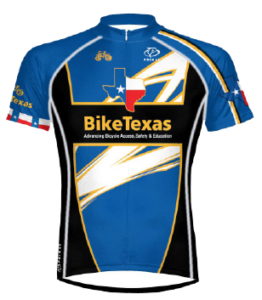 The winners will be selected by a panel of individuals from the Bicycling Industry. 1. Only one winner from each school will be eligible to compete in the State contest. 2. Entry must be original artwork created by a student who is currently in the fifth grade. A student may enter the contest only once. 3. The student’s first and last name must be written or signed in the lower right-hand corner on the back of the poster. a. Poster may be done in marker, crayon, paint pens, watercolor, ink, acrylic, colored pencil, and/or tempera paint. b. Collages are not acceptable. (Do not glue anything on your poster). c. Computer or photo generated art and/or printing is not acceptable. d. Entries should not display the names of commercial products, companies or organizations. 5. Entry must be no smaller than 8Â½ x 11″ and no larger than 14 x 18″. 6. Entry must be done on paper that will allow for duplication, display and framing. 7. The poster must be related to the contest theme in some way. The theme “Bicycling takes me places.” must be on the poster. All words must be spelled correctly. 8. Entry should not be matted, mounted, laminated, framed or folded. Poster may be rolled and mailed in a mailing tube. 9. Submit entry by March 1st to your state coordinator. 10. A completed entry form must be attached to the back of the winning poster. Designing a product in light of information given. Explore the causes, consequences and possible solutions to persistent, contemporary and emerging issues. How to act on personal and social issues, develop decision-making skills, and provide them with a foundation on which to base decisions they will face as citizens. In addition to a bike, light and a helmet one National winner will receive a three day/two night trip for two (parent or guardian and child) to Washington DC during the 2013 National Bike Summit (airfare and lodging included). 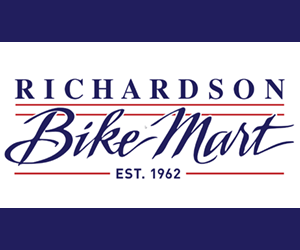 National winning school will receive bike parking for 20 bikes and The Hub System. The Hub is an active transportation tracking system. The Hub makes it easy, fun, and educational for a school to implement a walking & biking incentive program. Hardware, technology and a web-site gives students an easy way to count their trips; a place to watch the total participation of students; and a piece of cake way to administer the incentives to give to students.